Close your eyes and think about the best that Italy can offer. Visions of enchanting bays, cities and villages full of charm, culture and history. of a country rich in enchanting essences. 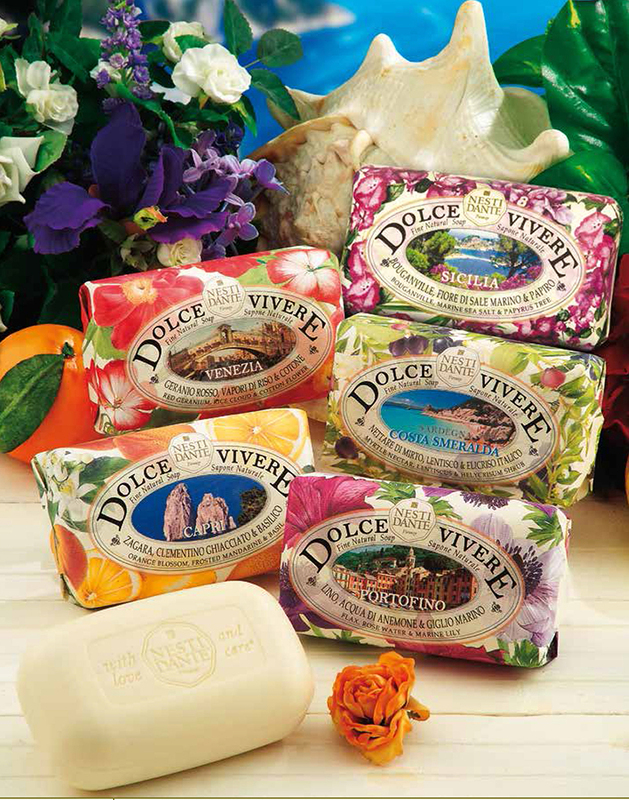 The Dolce Vivere line is a tribute to Italian beauty and life-style. Since 1947, Nesti Dante’s philosophy has been to be passionate about linking optimum quality with a sensitivity to all things natural and beautiful. A romantic and powdery fragrance with its bloomy notes of Red Geranium and Cotton Flower, wraps itself in the warm touch of Rice Cloud. Passion and creativity has enabled Nesti Dante to pay homage to the wonderful city of Venice. A tender and chypre fragrance, created by olfactory memories of artifacts and feelings, a real life experience. The Sardinian landscape that is unique to the world, with its wild notes of Helycrisum and Lentiscus Shrub together with Myrtle Nectar, captivates the senses in true Mediterranean Style. The clear, fresh morning air, the sun above the beach and the wild scent of berries evoke olfactory emotions and memories. The frozen freshness of Basil and Mandarine juice, together with the intense Mediterranean touch of Orange Blossom, reveal enchanting feelings of pleasure and harmony. With a surprising and unique fragrance, this Nesti Dante soap captures the charm and romance of the myth, the legend, the art and the passion of Capri. Reminiscent of a journey through the beautiful Italian coastal masterpiece that is Portofino, the classic harmony of Rose Water and Marine Lily meets the extravagant note of Flax, to reveal an unexpected sensation of pure bliss. A journey through beautiful sensations: bare feet in the grass, dew-drops on the fingers and the breeze on one’s face. A unique place...a beautiful bay, totally natural, an Italian masterpiece. Rome, a city boasting history, culture, government and art. Nesti Dante pays homage to this great world city with this soap. An explosion of sweet scents and sugary notes creates an atmosphere of eternal beauty. Experience the warm touch of Oleander In Bloom together with Muscat and Fig. Florence - a very special place, adored by many. 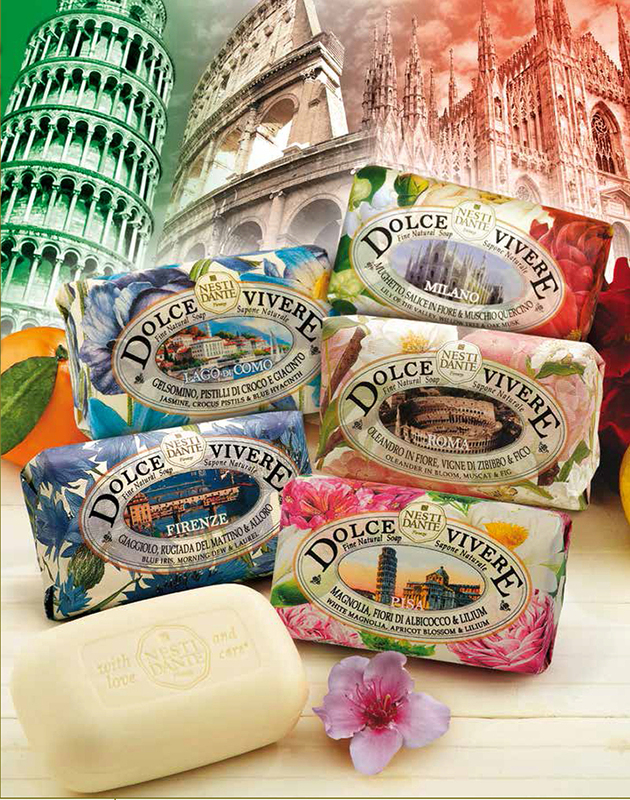 From such a place comes the Firenze soap. Sensual notes of Blue Iris and Laurel blend together, to create a sparkling fragrance rich in vitality and energy. Sensuous, fresh and invigorating, deliciously spontaneous and natural, Pisa soap is imbued with the floral notes of white magnolia, apricot blossom and lilium to create a fusion of light and positive energy. Just like its namesake in Lombardy, this soap releases a fresh and uplifting fragrance that is reminiscent of the clear waters and breathtaking valleys of the lake. Inspired by a summer afternoon on Italy's beautiful Lake Como, where the sun’s reflections on the lake and the sensual scents of jasmine, crocus pistils and blue hyacinth create a perfect harmony. Milan, Italy a city much admired for its fashion and style. The Duomo di Milano, Milan's magnificent Gothic cathedral, is one of the world's largest churches. Its dazzling white front facade, arguably the world's most beautiful, dominates the cathedral square. This stunning soap pays homage to this ancient city, featuring a tender combination of lily of the valley, willow tree and oak musk. The sunny exuberance of white balconies overflowing with bougainvillea that overlook the immense calm of the sea. This beauty idyll is enriched with the exhilarating perfume of papyrus, a rare and precious tree that nowadays only grows on the Sicilian island of Ortigia.